Welcome aboard WealthKeel airlines. I am your flight attendant, Chad. If there is a drop in cabin pressure, the panels above your seat will open, revealing oxygen masks. If this happens, pull your mask down and breathe normally. Please adjust your own mask before helping others. What does this have to do a 529 plan? Well since about 50% of our client base is either pregnant or became parents recently, 529 plans have been a hot topic. I use the above example to explain to our clients that their financial house should be in good order “before helping others.” By others, I mean investing money to their child’s 529 plan. A 529 plan is a great tool to help pay for education, BUT you need to make sure you are on track for your own goals and retirement. 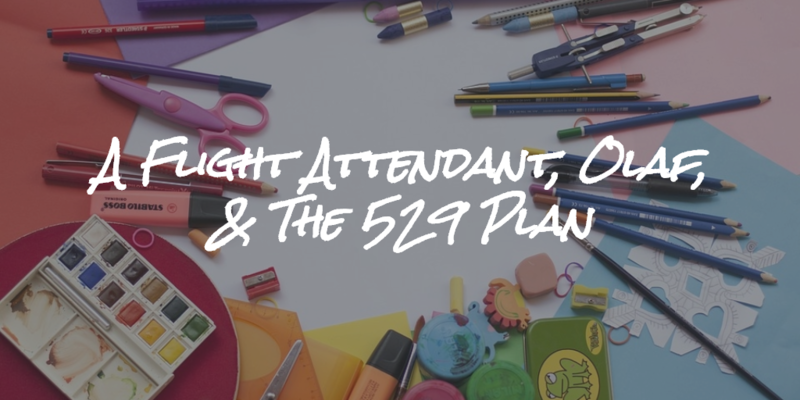 A 529 plan was what led me to only do full comprehensive planning early on. We had a prospect ask about opening a 529 plan, and without hesitation, we opened one for him. It was early in my career, and it was “quick & easy.” Later, I found out that this individual had bad debt outstanding, no emergency fund, and was not saving nearly enough for their own retirement. Was opening a 529 the proper advice at that time? Maybe, but not with a monthly investment to it. If they came to me today, I would have still opened the 529 for the reasons I listed above. However, I would not recommend monthly investments to it just yet because they have other items they need to take care of first. But you only know this if you do true financial planning. A 529 plan is an investment account for future college costs; this includes vocational schools and eligible post-secondary education. Yes, there are ways to use a 529 plan to buy future college education credits, but it is not all that common. Here is the cool thing, “college costs” can be anything from tuition, books, room & board, and even computers. Contributions to a 529 plan will not have a federal tax deduction, but earnings will grow federally tax-free, and your withdrawals will not be taxed, assuming you are paying for approved expenses (known as qualified withdrawals). At last glance, 33 states offer state income tax deductions for contributions to a 529 plan. My home state of Pennsylvania is one of the few states that allow you to take a state income tax deduction for non-Pennsylvania 529 plans. This is an excellent feature for PA residents because it allows you to pick a 529 plan that has the best platform. PA is unique, and I think only two other states allow that to happen. Most states will only provide the deduction if the contribution is to their state’s 529 plan. Here is a great resource to review your state’s 529 plan. Why should you open a 529 plan? Yes, you should open a 529 for your child. Here is why: it is one of the best gifts family and friends can make for your children’s future. What is more valuable to your kids today, the set of Frozen characters that will be fun for a few months, or a $25 or $50 contribution to their 529 plan compounding over 18 years? Here is a hint, it is not Olaf! Plus, that song has ruined my life for nearly a full year. If you want to be the cool Aunt and Uncle, write a check for $50 to their 529. Let’s assume a 6% annual rate of return over 18 years, and boom, $50 gift just became a $150 gift with our friend compounding interest. You also just became the coolest Aunt & Uncle, congrats! I digress. Open a 529 plan, tell friends and family about it. Ask for contributions for special events and holidays, and tell people you already have enough Olafs (toys). As an added bonus, depending on the state, they may even get a state tax deduction, Olaf can’t do that. Even as parents, I know I yelled at you for “monthly contributions” but you can make one-time contributions on holidays and special events; $100 for Birthdays, $200 for Christmas, $50 from the Easter Bunny, $25 from the Tooth Fairy, whatever schedule you want to go with! Don’t stress yourself by having to invest $150 per month to a 529 plan while your emergency fund is at $0, your 401k is getting 2% of your salary, and your three credit cards all have balances. Open the 529 plan, and if you can add money to it great. If not, have others gift to it. In 18 years, you would be shocked by how much you can accumulate with miscellaneous contributions. Grandparents also love these 529 plans! We have a few clients that opened the plans, told the grandparents, and now the grandparents are saving monthly to it! How do you open a 529 plan? Can you do it on your own? Yes. For Pennsylvania’s 529 plan, you can open an account right online. Keep in mind, you do need the social security number of the beneficiary (person who will use the funds for college). The hardest part will be picking the investments, however, they make it easier today with age-based options and pre-built portfolios. For example, PA uses Vanguard, and Vanguard will offer 3 age-based options and 12 portfolio options. We give our clients the option, open the 529 plan on your own and we can walk you through it. Or, we can set it up for you and manage it. With the understanding, if we do it, it will be more expensive due to the commissions. For some reason, the 529 plan is the last account out there that can’t be opened on a fee-only platform. I fully expect that to change soon. There are still some states that are only “directly sold,” meaning an advisor can’t open it for you, only you can. The donor, person who opened the account, maintains control of the account at all times. The donor can even change beneficiaries. This is drastically different than an UTMA/UGMA account where the child takes control at a certain age. With a 529 plan, if junior gets out of line, tell him/her they can live with student debt like his Mom & Dad did or get their sh*t together. If you want to get a jumpstart on a 529 plan, you can list yourself as a beneficiary of the account and then change it to your child once he or she is born. It is a cool way to get a head start and/or take advantage of some state income tax deductions. If you don’t use all of the funds in the 529 plan, the remaining funds can be transferred to siblings or even a first cousin. If you don’t need the funds for college, the government will burn the money. Just kidding, wanted to make sure I still had your attention. You can get the money out, but you will have some taxes and possible penalties on the earnings portion. The 529 plan is a great estate planning tool if you need to reduce your taxable estate (a good problem to have). Grandparents, or anyone else, can contribute 5 years of gifts in one lump-sum per grandchild. Current annual gifting limit is $15,000 per year, take that times 5 and you get $75,000 (2019). Technically, Gram and Pap can do this for each grandchild, which would move you up to $150,000. Again, great problem to have. With so many of our current clients asking the questions above -- I feel like there is a WealthKeel baby boom occurring -- I figured it was time to put some of the information into a blog. This is really a top-level overview and there are other pros/cons to a 529 plan, but this should give you enough information to get started. My favorite quote to end my 529 plan conversation is this, “Your kids CAN take a loan out for college, but you CAN’T take a loan out for your retirement.” Cliff note = make sure you are on track for your goals before helping others. Thank you for flying with WealthKeel airlines. For ANY tax notes above, I am not an accountant or a CPA. Please be sure to consult an accountant or CPA before implementing. This blog does not constitute tax advice.